Skywalker is a hybrid product of the blueberry and mazar strains. This Indica dominant strain is known to provide above average pain relief, headache management, appetite stimulation and heavy sedation. The skywalker strain is sticky and mildly fragrant with fruity undertones and a flowery scent similar to other indicas. The effects are immediate and last up to two hours. It is obvious why Skywalker has become such a popular strain in the last few years. It has a potent funky aroma/taste similar to OG Kush, which leads many to believe it is a straight indica...at least until the potent head rush kicks in. A few bong hits produces a hybrid-type high with some physical relaxation mixed with a creative, lucid high. Remember, the more you spend the better (9/10 times) you'll get, so try some today! Looks: Mostly small, tight deep green conical shaped nugs with a crusted layer trichs. 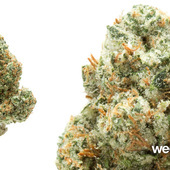 Smell: A very earthy and "sharp" dank pine smell with hints of lemon and fuel. Taste: Very similar to the smell. Very earthy with some lemony highlights, but mostly pure dank, smooth "earthy" smoke. Buzz Type: Extremely heavy head buzz. Eyes felt like they were sinking further back into my head. Pressure all around the head. Excellent pain and stress relief! * I always crack a grin when I see Skywalker OG on the menu. Having it several times, it has become a favorite strain of mine. But, it's been a few months since I have medicated with Luke himself. Actually, the last time I had it was December 2010. So, on my very first bowl from my refill, it was HEAVY! It put me straight to bed. I am usually up until 1:00 - 2:00am. The first night medicating with Skywalker OG, I found myself crawling to bed before 10:00pm. That is EARLY for me. But a full shutdown and long good night's sleep is just what my body needed. Skywalker OG is a heavy Indica strain consistently couch locking me during evening and late night sessions. I did a Sunday morning "wake and bake" session and this strain basically put me in a lazy, "whatever" kind of mood. I had a stress free Sunday which was very pleasant. Skywalker OG is a very smooth smoking strain for how heavy it hits you. I was able to take nice smooth rips and for those times I needed a little extra, I was also able to take deep hits with very little "cough" factor. This strain is stoney and bit euphoric too. I felt a bit "drunk" like a few times as it felt as if I was swaying when walking. This strain's biggest benefit for me is the pain relieving qualities on top of releasing stress. When in some serious pain, a strain like Skywalker OG is one I want to have on hand. A bowl of this does me just as good as a Vicodin or "narcotic" pain pill. During my last marijuana nugget of Skywalker OG, I actually medicated after doing a 7:00am 5K morning jog. Taking a week off from the gym, I decided to jog 5Ks for that same week. The first day, I was in tremendous knee and neck/upper back pain (it's been half a year since I jogged outside so, got to work up those "running muscles" again) and bowl of Skywalker OG light sabered that pain away. Being this was in the morning, I was a bit groggy. But, my pain was gone and since I had a good amount of morning caffeine in my system (~200mg), I was "slow" but, not couched. I have never had a bad bowl or batch of Skywalker OG regardless of what collective I've obtained it from. It is just an overall solid strain that performs time after time again. I love feelin' that force... probably why Skywalker OG is one top favorite OG's! This skywalker og is superb. Taste is excellent and taste like some OG's i've had back in the day. The bud is very well manicured, no signs of massive fan leaves any where. I usually get stoned for around an hour after about a joints worth. A very worthy bud indeed!